OFFBEATSAHYADRI : TREK TO VASOTA AND NAGESHWAR ON 23RD AND 24TH OF NOV 2013. 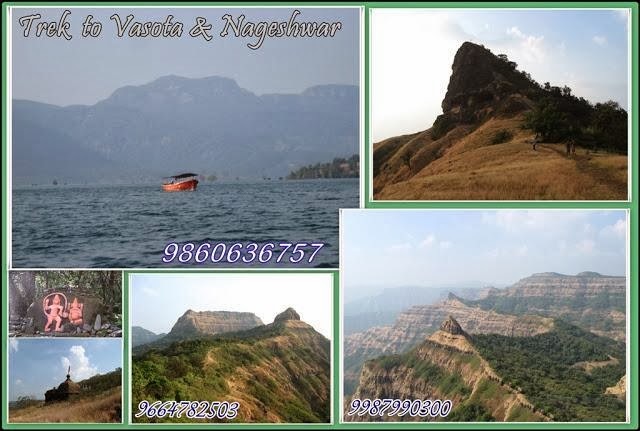 Trek to Vasota and Nageshwar on 23rd and 24th of Nov 2013, starting on 22nd Night. We invite you to an overnight trek to Vasota and Nageshwar on 23rd and 24th of Nov 2013, starting on 22th Night. Situated amidst the evergreen forest of Koyna Wild Life Sanctuary vasota offers the best experience of a Jungle trek. Route till the fort from Met Indivali is all covered with huge trees and the liana spread over miles. The canopy offers the best site for spotting various species of butterflies and birds. The sanctuary is home to a wide variety of animals Leopard, Sambar, Barking deer, Porcupines, Grey Junglefowls, Wild pig, Hanuman langur, Rhesus macaque and Flying Squirrel etc. Vasota Fort :Entrance in the dilapidated state, remnants, Hanuman temple and mahadev temple are the only monuments still standing on the fort. but the plateau offers breath taking view of the thick forest and the Koyna Back Waters. The Hill where Nageshwar Cave is situated can be seen from the Mahadev temple Machi. From here one can observe both side the Ghat area as well as long drops in the konkan. The most fascinating point is Babu Kada, from which offers spectacular view of the steep cliffs of the mountain range falling straight deep in the Konkan area. The mountain in front is known as Old vasota. A walk of few miles across the ridge takes us to a pinnacle in which the Nageshwar caves are carved. The cave hosts Mahaved lingi and the miracle here to observe is a crack in the roof percolates water on the shiv lingi throughout the year even in dry seasons. Wear comfortable cotton clothing, carry sufficient warm cloths and proper bedding as it might be too cold at night. Keep the baggage light, Please do not carry sling bags or Jholas. Carry proper bag pack, with all the zips working and no damaged strands.